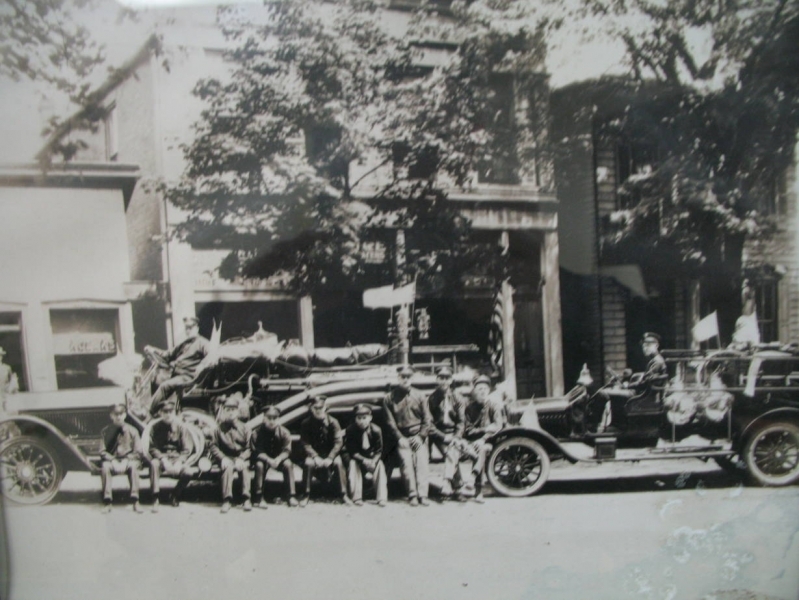 Purchased in 1922 to replace the hand drawn carts, these were the first modern motorized fire apparatus for Millersburg. The American LaFrance Type 48 Triple Combination Pumper, Serial# 4135 was purchased for $9,500 and had a 600 gallon tank. ALF Records indicate that this pumper was Shipment Order 76388 and was shipped on 3/24/1923. It was sold in 1948 for $250 when it was replaced by D200 and D201. The Ford was a Chemical Hose Wagon that served until 1929 when it was replaced with a new American LaFrance Type 91 Foamite Engine. ALF Records indicate the Type 91 Foamite Engine was Serial# L-319, Shipment Order 25972 and was shipped on 3/14/1929. This picture was taken on May 30, 1927 at the Memorial Day Parade.